One of Paris's most famous landmarks is the Arc de Triomphe, built by Napoleon Bonaparte to immortalise the heroics of his Grande Armée. Of classical design, the massive triumphal arch rises majestically above the streets of Paris. 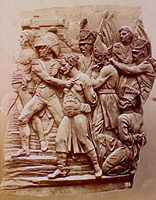 The piers feature bas reliefs showing aspects of the Revolutionary and Napoleonic Wars. Enscirbed on the columns are 126 battles and the names of the 662 marshals, admirals and generals who fought for France during the Revolutionary and Napoleonic Wars. On the right and facing the Champs-Elysees is Rude's departure of Marseillaise volunteers to defend the country in 1792, to the left is Napoleon's Triumph of 1810 by Cortot. The army's defence of France in 1814 and the Peace of 1815 are on the other side of the monument facing away from the city's centre. There are underpasses from the Champs-Elysees andr Avenue de la Grande Armee to get to the foot of the Arc de Triomphe.